A variety of fresh sushi just steps from the Theatre District. : Located in the heart of Chinatown, this small sushi haunt is a favorite of health professionals from the nearby Tufts Medical Center. Irashai has just a handful of tables and an even smaller number of chairs at the sushi bar, so come early during peak lunch and dinner hours or prepare to wait. Translated from Japanese, Irashai means welcome, and the friendly staff does its best to make everyone feel like they have entered a family member's restaurant. As for the menu, we recommend starting with a sampling of the sliced white tuna tataki or the steamed Japanese shu mai shrimp dumplings (also available fried). For a sushi main course, try a sushi/sashimi/maki combo, which is especially appropriate for a large party to share. 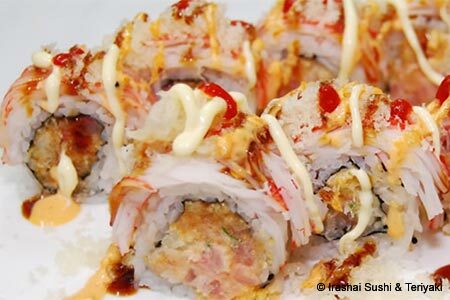 Signature rolls get a little more playful with tributes to the city with Red Sox, Celtic and Boston maki. Traditional rolls are some of the cheapest in town, with most under $6. Teriyaki plates are a value, too, served with miso soup and white rice. Heartier fare include noodles in every form --- ramen, udon or soba; they can be tossed with chicken, beef, vegetables or seafood and prepared miso-style, with soy sauce or kicked up with a fiery hot sauce.